When I first started working with national accounts, I found that the people I called didn’t always pick up the phone. Being a rookie, I was eager to get in front of people and make connections, so I quickly said “yes” when a hiring manager suggested that I sign up for a 5K run on their company campus. 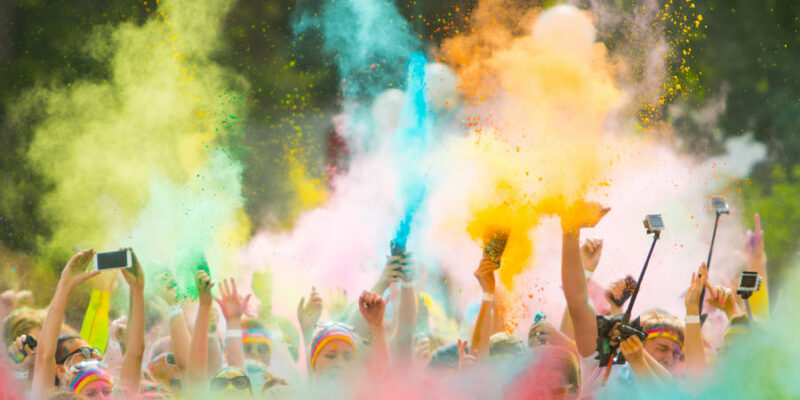 Besides being scheduled at 2 p.m. on a 120-degree day, this event offered the bonus of being a “Color Run,” so participants got splattered in paint to celebrate crossing the finish line. Two of my colleagues agreed to join me, and we all donned our long-sleeved Signature tee shirts for the occasion. I soon found my pace at the back of the pack, and quickly drank my ration of water. As my feet pounded the pavement, a migraine pounded the inside of my skull. I felt woozy. Thirsty. My run became a walk, bolstered by moments of determined short sprints, and a naughty desire to take a short cut. I felt terrible. I walked. Yet I kept moving forward. As my bleary eyes looked for the finish line, my color-doused colleagues waited for me among the thinning crowd and apologized that I’d missed the paint. The hiring manager who invited me shook his head, “Gina, wait, this isn’t right.” He returned with a cup of paint and properly anointed me. I said, “Thanks!”—exhausted, but proud to be dripping in blue. I’ve since learned there are easier ways to break the ice with people, though I’m happy to report that my pain did pay off. Our office has since built a great relationship with this account. We have several recruiters heavily engaged across their organization. National accounts are really about a group of people connecting with another group of people. You’re not alone working on an account—there’s connectivity within the employer’s organizational chart, which means that what you do impacts the others on your team. It’s truly like a platoon, where we can’t let each other quit; there’s a commitment because many families are depending on you. There are going to be rough spots and hard work, and life will bring you challenges. But if you don’t allow yourself to make any excuses, you can figure it out and push through. Just finish. There’s glory in getting through. Previous Post Details, Details, Details.